50 Cent says he was impressed with Obama's speech on race. (CNN) - Hillary Clinton appears to have lost a high-profile backer to rival Barack Obama. 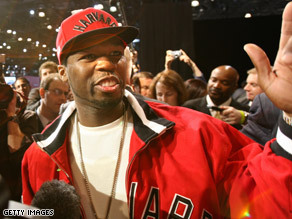 Rapper 50 Cent, who told Time magazine last September he was supporting the New York senator's White House bid, now says he has decided to shift his allegiance to Obama. The multi-platinum star, born Curtis Jackson, told MTV News Friday that Obama's recent speech on race was the deciding factor for his decision. "I'm Obama to the end now, baby!" But the musician also admitted he's lost interest in the protracted Democratic race, and may not support either candidate. He also said he didn't think the country is ready for a black president. "I just think there's people that might not be ready for an African-American president," he said. "It'll be an issue, believe it or not." "You've got to be conscious of racism, period," he continued. "And it's still there. We don't deal with it as often as my grandparents did. My grandparents grew up in South Carolina, so they experienced the heart of that." 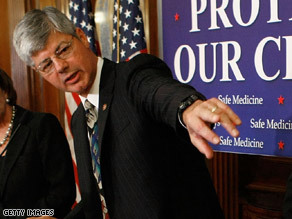 Stupak is proposing a new plan to seat Michigan's delegates. WASHINGTON (CNN) - Michigan Rep. Bart Stupak proposed a new plan on Monday to seat his state's Democratic delegates to the party's convention in August, factoring in both the results of the state's January primary and the total popular vote of all the primary contests nationwide. In a proposal sent to Democratic National Committee Chairman Howard Dean, Hillary Clinton and Barack Obama, Stupak proposed allotting 83 of Michigan's pledged delegates based on the January vote, while the state's remaining pledged delegates and superdelegates - 73 total - are to be awarded based on the nationwide vote. The DNC stripped Michigan of its convention delegates late last year after the state moved up its primary to January 15. Under pressure from other early-voting states, most of the Democratic presidential candidates removed their name from the ballot there. But Clinton opted to keep her name on the ballot and ultimately received 55 percent of the vote, compared to the 40 percent of the vote that went for "uncommitted." Under Stupak's proposal, Clinton would receive 47 delegates based on her vote total, while Obama would be awarded 36 delegates based on that "uncommitted" result; the rest would be divided according to the nationwide popular vote total after all the primaries are completed. Clinton campaigned in Pennsylvania Monday. HARRISBURG, Pennsylvania (CNN) – Despite the spitting rain and the chilly weather, Hillary Clinton lingered in a parking lot in Pennsylvania Monday before a campaign event to speak to a group of about two dozen truckers who had gathered to protest the effect of rising gas prices on their industry. Clinton was set to host an afternoon economic roundtable at the Capital Diner here, but when Clinton’s campaign plane landed in Harrisburg, her campaign learned from her advance staff about the small but vocal demonstration being held at the diner. The New York senator hustled out of her motorcade of SUVs on arriving to chat for several minutes with the truckers, who voiced concerns about fuel costs. As passing big rigs honked, some truckers told Clinton they were being blamed by retailers for the rising costs of trucking, a problem they said was owed to high gas prices. Clinton listened intently and then spoke about the need for the next president to focus on working families and alternative energies. She also promised to combat price gouging and examine the possibility of regulating oil markets. Two of the truck drivers, named Mark and J.B., were invited to join her economic roundtable inside the diner, where Clinton praised them for voicing their discontent. A new poll suggests Sen. Obama would be a tougher candidate for John McCain to beat. (CNN)— A new poll finds a majority of Republicans and Democrats feel Sen. Barack Obama would be a tougher candidate against the presumptive Republican nominee John McCain in a potential fall match-up. 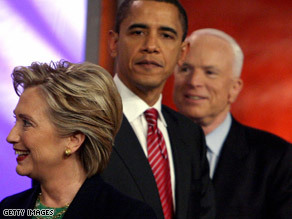 In a Gallup poll released Monday, 59 percent of Democratic voters believe Obama has the best chance at beating John McCain. Thirty percent said Clinton was more likely to win a matchup with the Arizona senator. Republicans surveyed say Clinton would be the easiest to beat: 64 percent said Clinton would make a weaker fall opponent for McCain, while just 22 percent said Obama. The survey of 1,005 adults conducted March 24-27 has a sampling error of 4 percent. The discussion of which Democrat stands the strongest against John McCain has been an ongoing debate since the Republican race narrowed leaving the Arizona Senator as the Republican nominee in waiting. A Gallup poll released last week suggested a majority of Democrats would cast a vote for John McCain this fall if the candidate they support does not win the Democratic nomination. This is particularly true of Clinton’s supporters, one third of whom said they will vote for McCain if Obama is the Democratic nominee. Cuomo’s plan is the latest proposal to resolve the Democratic impasse. (CNN) - Another day, another idea to end the remarkable race for the Democratic presidential nomination - this one from former New York Gov. 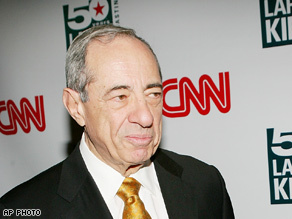 Mario Cuomo. In an essay in the Boston Globe, Cuomo warns of a potential disaster for Democrats if the race goes on and either Clinton or Obama supporters become embittered by the eventual outcome. Funny: he doesn’t suggest which candidate should be the nominee, and which the vice presidential nominee. And already, he is suggesting there are better odds for an alternative he raised in the essay: continue the nomination fight – but have both candidates commit now that if he or she wins, the other would be the vice presidential choice. It’s an interesting idea - and though it is unlikely to be embraced by camps Clinton and Obama, it is the latest reflection of the worry among some party elder statesmen that the protracted nomination battle is creating wounds that won't heal in time for the November election. Of course, there are others who dispute that the damage is lasting - they see record Democratic turnout and fund-raising as a sign the protracted race is helping, not hurting. Count former President Bill Clinton among this group, though also be very well aware of his bias. His weekend suggestion - those pushing for a fast resolution to the race should just “chill out” - was the latest proof his wife the candidate is in no mood to listen to those who say she should call it quits for the good of the party. Still three weeks to Pennsylvania. Plenty of time to chill, or debate the pros and cons of the protracted Democratic battle. Chill out. That's Former President Bill Clinton's advice to Democrats who think the race between Senators Hillary Clinton and Barack Obama has gone on too long. He says that letting all of the voters have their say will actually strengthen the party. This comes on the heels of two senior senators, Patrick Leahy and Chris Dodd, themselves Obama supporters, calling for Hillary Clinton to pull out of the race - something she says she won't do. Clinton told the Washington Post that she would take her campaign all the way to the convention floor if need be. Barack Obama says that Clinton has every right to stay in the race as long as she wants to. (CNN) - Nearly 79,000 Pennsylvanians registered as Democrats last Monday, the state’s deadline for those looking to participate in the April 22 primary. A near-majority of the Pennsylvania electorate is now Democratic – just over 4 million of the greater than 8 million voters in the state. Fewer than two in five are Republican. The one-day total includes more than 33,000 new voters and nearly 46,000 Republicans and Independents who switched their registration to the party, according to reports released Monday by the Pennsylvania Secretary of State. By comparison, around 7,800 Pennsylvanians became Republicans during the same period, including 6,000 new registrants and roughly 1,800 party-switchers. In all, 132,000 of the state’s voters have switched their registrations to the Democratic Party since January 1, while just 14,000 have moved to Republican rolls. Roughly 102,000 new voters have registered as Democrats since the beginning of this year; around 33,000 have become Republican. Those numbers may rise, as registrations submitted before the March 24 deadline continue to be processed. 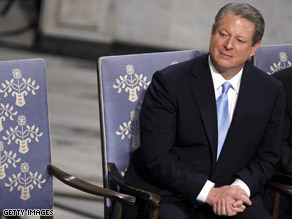 Gore said Sunday he does not anticipate getting involved in the presidential race. (CNN) - His name continues to get mentioned as a Democratic elder who could hammer out a resolution in his party's deadlocked presidential race, but former Vice President Al Gore said Sunday he's not interested in the job. "I'm trying to stay out of it," the former vice president said on CBS' "60 Minutes" of the prolonged race for the White House. "I'm not applying for the job of broker," he also said when pressed about the possibility he will be one of the few neutral Democrats who could sit Barack Obama and Hillary Clinton down together. The comments follow increased speculation that Gore, the party's 2000 presidential nominee, may be called to forge a compromise between the two candidates, or even appear on the top of the presidential ticket himself. But last week, Democratic Rep. Tim Mahoney of Florida suggested Gore, the party’s 2000 presidential nominee, could assume the role of a compromise candidate if neither Clinton nor Obama could reach a deal themselves. "If it goes into the convention, don’t be surprised if someone different is at the top of the ticket,” he told a Florida newspaper, adding Gore could be that choice. But Gore isn't staying out of politics completely. The former vice president also announced Sunday he's funding a massive, bipartisan ad campaign to raise awareness on global warming. The $300 million venture, funded largely by profits from his Oscar-winning film "An Inconvenient Truth" and the cash component from his Nobel Peace Prize, will feature political rivals jointly calling for action on the climate crisis. "Nancy Pelosi and Newt Gingrich, two people who don't agree on very much at all...are doing an ad together" Gore explained. Reverends Al Sharpton and Pat Robertson will also appear together, among others. TIME.com: Is Al Gore the answer? Obama has double digit lead nationally over Clinton, according to Gallup. (CNN)—Democratic presidential candidate Sen. Barack Obama extended his lead nationally over Sen. Hillary Clinton Monday according to the latest national polls. The Gallup Poll conducted March 27-29 with a margin of error of 3 percentage points shows the Illinois Senator has a 10 point lead over the New York Senator among Democrats, marking the first time since early February Gallup polls have shown either candidate with a double digit lead. In February, Gallup showed Clinton held an 11 percent advantage over Obama. Last week’s Pew Poll also confirmed Obama had weathered the media storm surrounding the Reverend Wright controversy and maintained his lead. Despite pressure from some powerful Obama supporters and being behind nationally in the polls, Clinton said the race should not end before all votes had been cast. "I didn't think we believed that in America. I thought we of all people knew how important it was to give everyone a chance to have their voices heard and their votes counted," she said. Looking to the critical state of Pennsylvania, Clinton holds a 12 percent lead ahead of the state’s April 22 primary, according to the latest CNN/Opinion Research Corporation poll released earlier this month.Both candidates continue to campaign heavily in the state of Pennsylvania Monday, where there are 158 pledged delegates up for grabs. Update: CNN poll of polls released Monday, which includes the results of several recent major surveys, shows Hillary Clinton with a 14 percent lead in Pennsylvania over Barack Obama. Update II: The latest Gallup tracking poll out Monday afternoon has Obama up by 8 points. 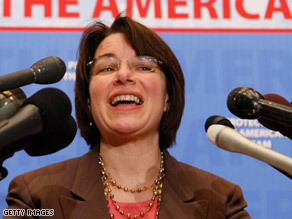 (CNN) - Minnesota Sen. Amy Klobuchar announced Monday she's backing Barack Obama's bid for the White House. "I am endorsing Barack Obama because he is a new kind of leader, he speaks with a different voice, he brings a new perspective and inspires a real excitement from the American people," Klobuchar said in a conference call with reporters. "He's able to dissolve the hard cynical edge that has dominated our politics under the Bush administration." 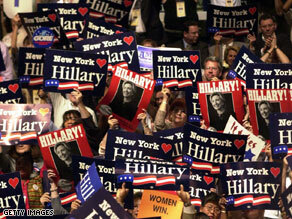 "Barack has inspired an enthusiasm and an idealism that we haven't seen in this country in a long time," she also said. Klobuchar was elected to the Senate in 2006 - the first woman elected to the Senate from Minnesota. "When I ran for the senate, I ran to bring change to Washington, not simply to become a woman senator. I am proud to be a woman in the Senate," Klobuchar also said. "My best friends are women in the Senate, but much like Senator Obama, I ran on a platform of change."